I started the day by waking up at two am. You may be wondering why exactly I did that. Well I've been just a tiny bit sick and I couldn't sleep. I decided that instead of just lying in bed, I could write and read my time away. I decided to actually work on something for my blog. That's when I remembered that today was Durga puja. This is one of the most important of all Bengali festivals. It celebrates the homecoming of a daughter. The goddess Durga to be precise. This festival celebrates the time of every year when Ma Durga comes back to Bengal, or her parent's home, after her yearlong stay with her husband. The most important thing however is the fact that she comes with her own children, and does not bring her husband. Thus leading into the other two celebrations of the year after her daughters, Lokhhi puja, and Shoroshothi puja. Ma Lokhhi is the goddess of wealth. This celebration usually honors all female children. Ma Shoroshothi is the goddess of wisdom. Another tradition is praying to the goddess before any big tests like the year final. Ma Durga's celebration is one of the biggest of all. A weird thing about the Bengali people's version of Hinduism, is that we only really celebrate the female goddesses and that is why Ma Durga's sons sometimes go ignored in Bengali culture. You may have heard of Ganesh, with his elephant head. You probably haven't heard of Karthik though, he is the god of generals. Sounds weird I know. I just learned this today. After my antics of the morning, I got ready to leave. I put on my long salwar and leggings which is the traditional Indian dress, along with the iconic sari. I got in trouble for not cleaning my room, as well as asking too many questions to do simple tasks which made me kind of mad and put us 50 minutes behind schedule. The first one was fair, but the second was kind of unjust, if I'm being honest. Anyway, I got into the car in a sort of sour mood thanks to the earlier predicament as well as me being sick. The day before had been kind of terrible too, as I realized my school computer screen had cracked and I would have to pay 80 dollars from my own savings for it, as well as getting a 94 percent in algebra for messing up a couple of directions just the tiniest bit, and getting deducted to a fifty percent for the day in health because I was asking the guy next to me to stop distracting me so I could work, and I was caught 'talking '. So I felt pretty terrible in general. We got there after a long while. I met up with my friend that I hadn't seen in almost a month and we got to catch up with each other a little bit. The second of three of the tests I have to pass to get my blackbelt was the week right after, and I ran into my other friend who was taking the test with me. Well not the most amazing day, but it was good. Me and the first friend walked around, exploring the campus of the college where it was being hosted, and chatting, catching each other up on what had happened at our respective schools. Me, the nerd that I am, loves role playing, and I kind of introduced her to that world and made up a character for her. I successfully got Hamilton stuck in her head, again. We got some candy and split it, and it was pretty much a great big honking celebration. That's kind of what Durga puja is really. A culmination of our culture and basically just another reason to party all night. That's it. Eat, party, dance, and have fun. Whether it's walking around getting stuff from vending machines, or saying hello to everyone you know, It's almost impossible to not enjoy yourself just a little. Another thing is that all families have at least 1 or 2 friend groups. And by groups I mean like 20 people. And their kids. It's actually kind of fun when all those 5-year-olds come over. Now by five-year-olds I mean 4 really cute but evil little boys and another really adorable little girl. Then there are of course three younger ones, two cuties being less than a year old, and the other a year and a half. I had fun with them. It's crazy how many weird conversations you can carry out with 5 year olds at 1 in the morning. You may notice that I didn't include any kids my age. Yeah, that's because in this group, there are none. By none, I am not kidding. You know that friend who I was walking with? She's from our other group, and the only one in any of the groups that is even remotely close to my age. I still enjoyed myself though, holding the year and a half year old little kid in my lap for almost the entirety of the time, playing peek-a-boo with and laughing with the 2 that were less than a year old, playing ball and building things with legos with the boys, and racing cars with them (trying to get into their brains that girls actually do like that kind of stuff) and singing Moana till my voice died on me with the little girl. Doing high kicks and showing off TaeKwonDo skills to not only excite the kids, but to show my improvement and love of that amazing sport to their parents who I consider my family, and getting to know the kids' grandparents who I had not previously known, or carrying out a conversation with those of whom I did know. Horsing around and making mischeif with a friend at a festival. Laughing and joking with people I know, bonding over where we come from, and where we are. Wearing a Sari on the second day of the puja, and running around in it like our parents would back in India, roughhousing with their friends. It's a really amazing experience. It may not be exactly like what goes on in India, but the essence is still there. I am glad to be a part of this amazing culture, and glad that I get to experience this, even when I live on the other side of the world. Like Moana, I love where I live, and I love the home of my ancestors. For her, that home was the ocean. For me, it's what's beyond that ocean. India. I don't want to leave, but I don't want to lose my roots either. Because what is a tree if not for its roots? I sincerely apologize for not posting for two years. When I last posted I was either an absent minded third grader or delusional fourth grader. I treated this blog kind of like a new shiny plaything at that time. What I realize now is that at that age, as soon as the toy isn’t “shiny and new” anymore, we tend to just forget about it. I simply forgot about this blog as well and used the play of ignorance to not write. By the time I probably would started writing again, I had pretty much had forgotten the fact that I ever kept a blog. I am now a young adolescent of twelve-years-old in sixth-grade and am resolving to fix past failures. I realize now how much of a benefit and enjoyment it was to write on this blog. When I was a few years younger, I used to think I had good grammar, spelling and could write very descriptively. I realize now how wrong I was! I apologize to you about lack of proper spelling, grammar, and overall editing of any kind. I also apologize to the feelings and ideas I wrote about because my inept writing skills masked the many feelings and memories of the moments I wrote about. This year I will be working on this blog on any spare moments I have outside of school, homework, Taekwondo, swim team, reading contests and whatever else I am usually busy with. I will work on filling in gaps on what I have posted before, making edits, and drafting and posting on some of the many things that have happened over the past 3 years(when I was posting and when I wasn’t). I will be posting these on the dates that they happened or the days that I normally would have written about them. By the way, if no one ever reads this I am okay with that. I didn’t post when I had at least a few followers so now I have none(I think). It makes sense and so I am just doing this for fun. I am going to clear up a few misconceptions about myself. My previous posts have portrayed me as a techie but nature loving person. I am doing this to prove my other side to people who don’t know my literature side as well. Since they will never read my blog and thus my posts probably won’t prove anything, I suppose I am proving it to myself. If anybody is out their reading this, I would like to let you know who I am. I am a happy, fun loving person with an amazing family. I am a extreme extrovert and a very social person. I love tech, am learning how to program, and like helping others. I am a free-spirited kind of person who doesn’t like rules but abides by them. I am well versed in English and history, and generally known as verbose. In short, I am a techie, music geek, choir geek, fact collector, writer, doodler, speed reader, history buff, musical geek, etc. My attitude though I cannot speak of with exact certainty. Everyone knows me as something different. Some people know me as a nonchalant, sarcastic, slightly loud person, who laughs easily while others see me as a serious, quiet study, but who isn’t shy as she constantly raises her hand to answer questions, works independently, and people usually want to group because I have a habit of doing their work for them so we can get done faster while still others see me(mainly my camp friends) as “a happy go lucky kind of person who thinks things through while while still managing to rushing headlong into things, a daredevil and is usually the person you look to for a good cheering up if you are down in the dumps.”(their quote not mine)If you want to know more about me, I have made an idea of making personality presentations with my closest friend groups and will undoubtedly post mine if at all possible. Thank you for reading and surviving through this chunky apology letter and happy Valentine’s Day! A few weeks ago I read a book by Holly Goldberg Sloan called Counting by 7s. We have a assignment to make a book report on a book we have recently read, so I chose Counting by 7s as my book. I recited my review to my parents (also known as Bongcook and Bonggeek) and they said I should post it on my blog so that is exactly what I am doing. I hope you enjoy it as much as they did. 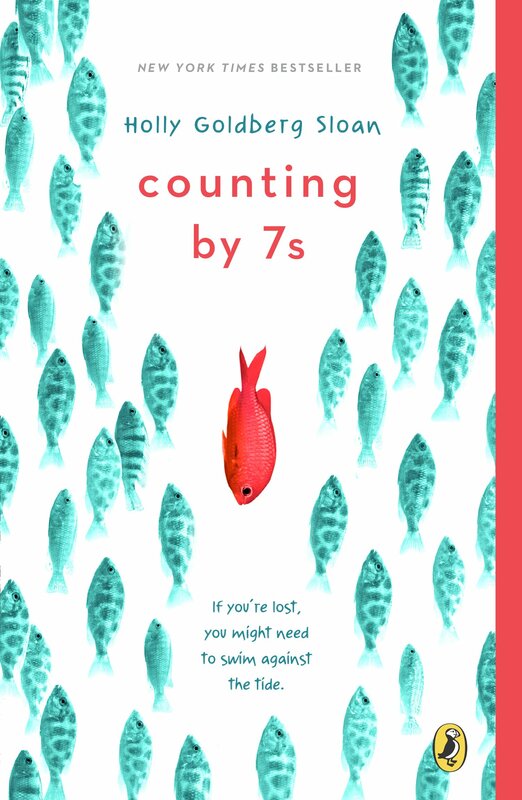 Counting by 7s is a book about Willow Chance, an orphan girl who loves the number 7 and how she struggles through her life when a disaster takes place. As Willow makes friends along the way, not only do they help her through difficult times, she helps them see things they never would have thought of before. Since Willow never had any friends before these ones, she has made special connections with each and every one and gives them new thought and changes there lives. Though all of her friends are very different, they stick together when thinking of Willow’s own good. This book is written in the perspectives of all of Willow’s friends as well as herself. This book is rich in it’s own uniqueness and the emotion of the story, and is so good that once you pick it up you’ll never, ever want to put it down. When we went to the San Juan islands me and my friends and family stayed in a cabin. In the back yard there was a fire pit, chairs and thorny trees. The rest was a small meadow like field with a bunch of flowers creating a carpet of vibrant white, yellow ,green, and purple. Every night that we stayed we made a fire. My jobs were to help the logs catch fire by sticking twigs in, making a bridge of fire, feed the fire newspapers and kindling the fire. One night my dad got me all the supplies for making smores. I used real twigs and made smores for everyone. This was the first time I made smores with my family but I knew how because of Camp Coleman from YMCA. Always when everyone else went inside, me and my dad would sit and enjoy the last bit of the fires glow and heat. This memory of me and my father and this trip will always stay in my heart. Right then I felt so sad for the bird I decided to make a grave for it. 2 days later a squirrel named Pesky (I named him Pesky because he always eats the bulbs I plant and he chews on our flower stems) tore some daffodils to eat but he didn't finish them and so me and my friend Cristina Improved the grave by adding the daffodils and some other things. Now my dad says that the grave is the most beautiful place on our entire property, and people might destroy it if they find out about it and so we should keep it a secret between us. It was hard to keep it a secret between us , but we’ve managed to do so until now.